Discussion in 'Ammo & Reloading' started by deerwhacker444, Mar 8, 2016. I've got the parts just laying and was thinking about giving it a shot. This is a dummy round of what the finished product would look like. Weight of the #8 shot and capsule run around 108 gr, well within the 9mm's capability. The COL is quite long, but the projectile is seated the normal seating depth for a 9mm round. They're not locking up the cylinder, although they look goofy. I was thinking about 5.0gr. of Unique. Will this work or will this make me a Darwin candidate? Don't know, but film it please. I doubt it does damage to the gun, but I'd wear gloves and glasses at minimum! looks like the only thing different from a factory 9mm shotshell is that their cases are longer. I have made 45acp shotshells but it was all contained inside the case with a .357 gas check. the round was good for 15 feet or so. After that the spread got large like a donut .. may act different with that plastic container holding the shot. The factory CCI shotshell has something like 53gr. of shot in it. I'm guessing they have to keep it short to deal with cycling issues. Since I'm shooting these in a revolver, I don't have to worry about that. 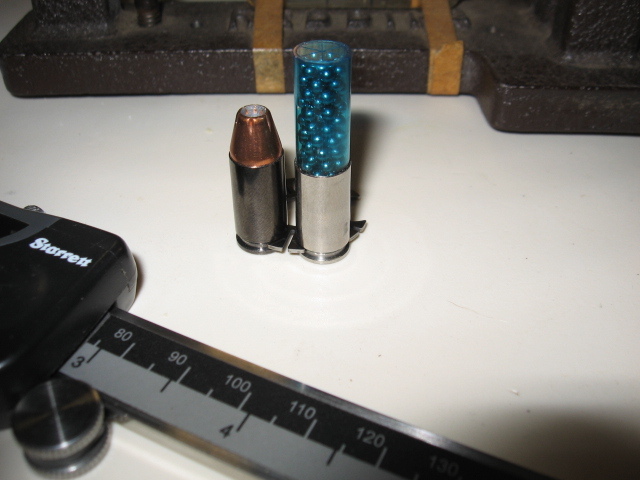 I used the whole capsule, which makes it basically full cylinder length and holds around 108gr. 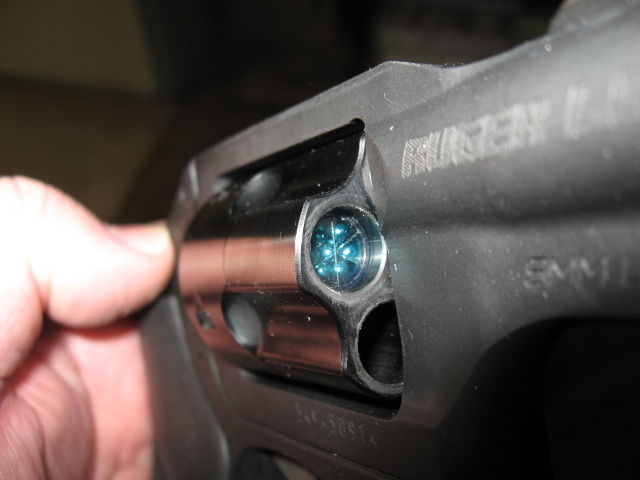 of shot, which ought to be doable in 9mm. That allowed me 4.5gr. of Unique and just enough capsule to grab ahold of with a light crimp. I'm finding that there's a thin line between crimping the case and cracking the capsule. 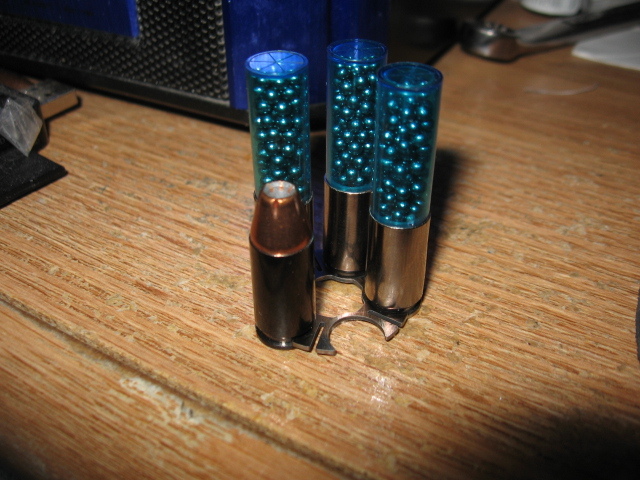 I'll be surprised when I shoot the first one, if the other 2 don't crack and break or jump forward in the cylinder a bit, since I haven't been able to put a super duper crimp on em. Will give it a go when it dries up a bit.. Your good to go. 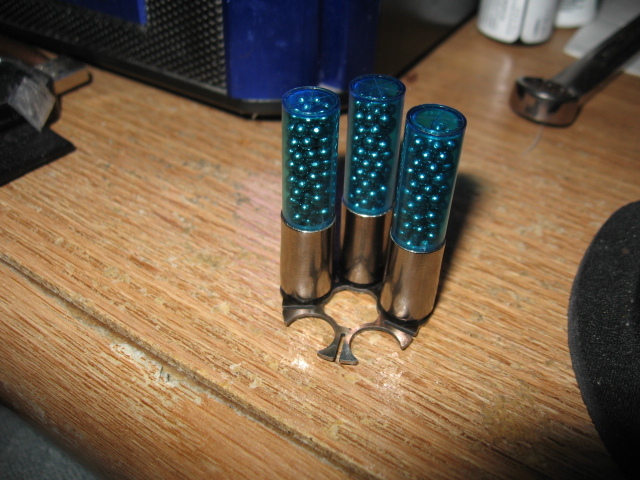 I have the speer shot capsules for .44 mag, and .45 ACP. I called Speer and asked their recommended load. For both they said 5 grains of Unique. He said they can be ran faster, but shot deformation becomes problematic after that. I will say the .45 acp shot loads are much tighter than the .44 mag loads with the same powder charge. .44mag shot from a revo, and the .45ACP shot from a 1911. Great close range garden rounds. David Adams New to the site! Did this work out? What OAL, if it did? Thanks. I put them in a pill bottle stuffed them in a drawer somewhere, so don't have the OAL. I made them short enough to work in the LCR and a little cushion room in case the plastic jumped a little..